In a large ovenproof skillet, saute the onions and garlic in oil for 1 minute. Add the yellow squash, zucchini, peppers and ginger; cook and stir for 8 minutes or until vegetables are crisp-tender. Add the chicken and ham; cook 1 minute longer or until heated through. Remove from the heat. In a large bowl, whisk the eggs, mayonnaise, horseradish and pepper until blended. Pour into skillet. Bake, uncovered, at 350° for 25-30 minutes or until eggs are completely set. 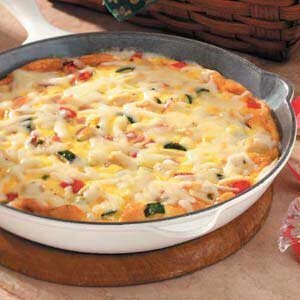 Sprinkle with cheese; cover and let stand for 5 minutes or until cheese is melted. Makes 6 servings.